Recently, I inherited the task of organizing and cleaning the home of a lady who never threw anything out. I found a broken meat thermometer in the drawer and was going to toss it. Then, I thought, "Hmmm what could I do with that?" It hit me that it looked like an simple version of a paper spike from office desks of long ago. So, that is what it is now. My sample is just a post it, but you get the idea. 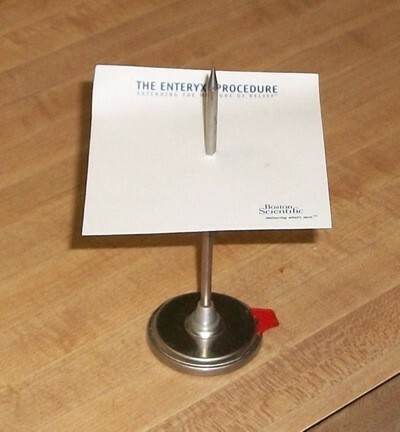 I hope this helps to keep your paperwork straight and the landfill one less meat thermometer full. I just love "light bulb moments". Nice idea, and I might use it for storing my stack of business cards, but I would recommend making some kind of a safety cap to put on the tip of that spike. Looks a little dangerous to me. I love light bulb moments, too. Yeah, the top is spiky but so is a traditional one that you can get at the stationary stores. How about using it, then putting an eraser on top...like the ones you slip over pencils that are worn down? See, sensible and safe!